Both sexes: Black back and wings, white head and body. Pink legs. Yellow bill with red spot near tip. The Great Black-backed Gull is the largest gull found in Britain and, as well as being well-built, it has a powerful bill. The head and body are white while the wings and back are black. The wings are edged with white. 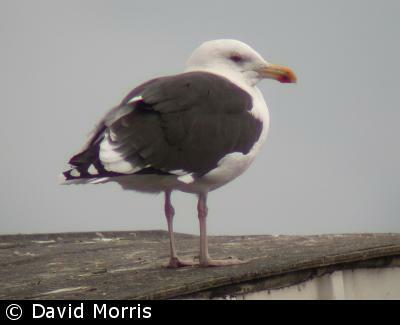 The bill is yellow with a red spot, like the Lesser Black-backed Gull and Herring Gull. The eye is yellow with a red orbital ring. The legs and feet are pink; these facts together with the size of the bird are distinguishing features. In the wintertime the head is lightly streaked with grey. Juveniles and first winter immature birds have chequered grey-brown plumage and black bills. By their second year, the bird still has immature plumage but only the tip of the bill is black. The black back and wings are gradually acquired from the third year and the bird reached adulthood in its fifth year. The British population more or less doubles during the winter as resident birds are joined by birds from Norway. In flight, the wing beat is slow and heavy. The Great Black-backed Gull's call is a chuckling "uk uk uk". Their diet comprises birds, eggs, fish, crustaceans, road kills and refuse, which they will "catch" themselves or steal from other birds. This gull breeds in colonies but also as solitary pairs, usually on cliff tops, islands, and estuaries, but also moor land. The nest is built by both birds and is a large mound of sticks, seaweed, grass, and feathers. The solitary pairs often prey on other seabirds. The eggs are buff to olive coloured with dark brown blotches, and are incubated by both birds. The young are fed and cared for by both birds until they can fly at about 7 weeks old. Most of the British breeding population is resident but is joined by immigrants from Scandinavia from late summer to late Winter. For many years up to about 1875 the Great Black-backed Gull was persecuted and came very close to extinction. Today, the gull is generally thriving owing to better legal protection, but moderate declines have been reported in some areas and it is now an amber list species of conservation concern.